Delphos Jefferson’s Alex Rode goes for a shot against Lima Central Catholic’s Matthew Cecala during Friday night’s game at LCC. Delphos Jefferson’s Brenen Auer attempts a shot against Lima Central Catholic’s Mark Janowski during Friday night’s game at LCC. LIMA – The last time Lima Central Catholic and Delphos Jefferson squared off was in the sectional opener last year and the Wildcats sent the Thunderbirds packing from the postseason. 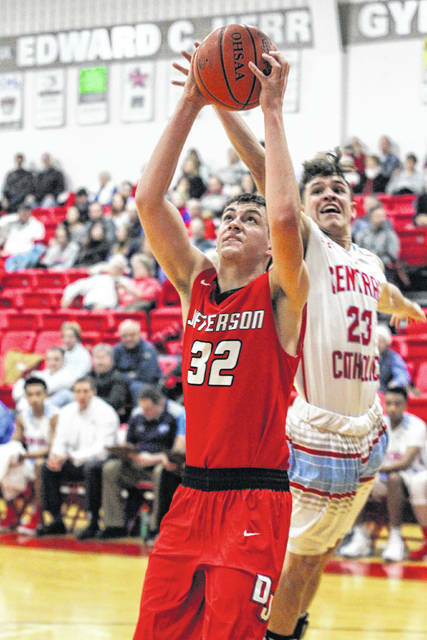 And while the stakes might not have been as high Friday night, LCC, thanks to a smothering defense performance, exacted a little revenge by beating the Wildcats, 58-36. With the win, LCC improves to 3-1 on the season and Jefferson falls to 2-2 for the year. LCC head coach Frank Kill was happy to get the win but said there is still plenty of room for improvement. Kill added that their offense had too many turnovers and were careless with players were forcing passes. Jefferson head coach Jorden Jettinghoff said his team did not execute its offense and it showed. In the game, LCC held Jefferson to single digits in two of the four quarters and the Wildcats were 8-of-30 from the field. From behind the 3-point arc, Jefferson was a dismal 0-for-8. 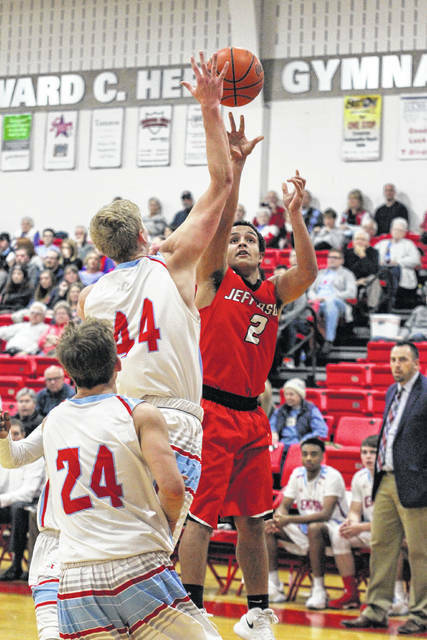 Like Jefferson, LCC was not exactly lighting up the scoreboard, however, the Thunderbirds produced a second quarter where they outscored the Wildcats 19-12 to go up 29-16 at halftime. LCC opened that lead to 21, 43-22 at the end of the third quarter after outscoring Delphos 14-6. The Wildcat did manage to cut the lead to 10 midway through the fourth quarter, 45-35, after opening the final stanza with a 13-2 run but some key buckets from Dominic Riepenhoff and De’Montre Garner helped hold off the Wildcats. Janowski, who battled foul trouble throughout the game, scored nine of his game-high 13 points in the pivotal second quarter. Garner finished with 11 points and six rebounds and Brenden Stolly finished with 10 points. Kill praised the efforts of Riepenhoff, who finished with six points, and Garner coming off the bench and providing quality minutes. For the Wildcats Brenen Auer scored 15 points and grabbed seven rebounds. Both teams face stiff competition tonight when Lima Central Catholic will host Ottawa-Glandorf and Delphos Jefferson faces Pandora-Gilboa. https://www.limaohio.com/wp-content/uploads/sites/54/2017/12/web1_LCC-vs-Delphos-Jefferson-BBB-0128.jpgDelphos Jefferson’s Alex Rode goes for a shot against Lima Central Catholic’s Matthew Cecala during Friday night’s game at LCC. https://www.limaohio.com/wp-content/uploads/sites/54/2017/12/web1_LCC-vs-Delphos-Jefferson-BBB-0145.jpgDelphos Jefferson’s Brenen Auer attempts a shot against Lima Central Catholic’s Mark Janowski during Friday night’s game at LCC. Jose Nogueras can be reached at 567-242-0468. This entry was tagged delphosjefferson, limacentralcatholic. Bookmark the permalink.